Distinguished university professor at the University of Maryland College Park and Johns Hopkins University Bloomberg School of Public Health, senior advisor and chairman emeritus at Canon U.S. Life Sciences, Inc., and founder and chairman at CosmosID, Inc.
"For articulating and demonstrating a clear vision of how the interplay of science, engineering research and education, and public policy is necessary to enhance the welfare of our Nation and its people." 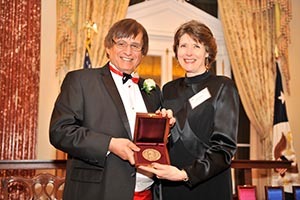 "For his extraordinary leadership, inspiration, and advocacy to increase opportunities for underrepresented minorities in science; distinguished public service leadership in science and engineering; and exceptional contributions to mathematics in the area of computational optimization." 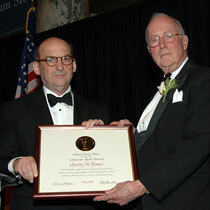 "For unsurpassed dedication to the scientific enterprise at all levels – as a creative researcher and inspiring educator, as a wise mentor and willing advisor, as a remarkable leader in advancing the National Science Foundation to new levels, as a tireless champion of science and technology in the halls of power, and as exemplar of the concept of civic scientist." 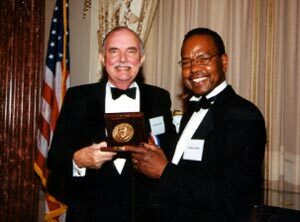 "For his extraordinary contributions to understanding the basic forces and particles of nature; science leadership in elementary-particle physics in the U.S., and science statesmanship around the world; and his relentless advocacy for and contributions to science, technology, engineering, and mathematics education." 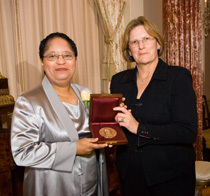 "For tireless and visionary leadership in championing the role of the modern American research university as an innovation engine focused on developing scientific and technological solutions to benefit society, and as a leading voice for strengthening gender and ethnic diversity in higher education." 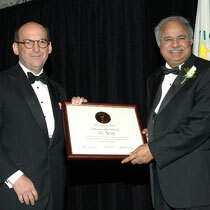 "For his dedication to the creativity, openness, and tolerance that define science; passion for improving the human condition; and transformational and inspirational leadership in science education, international capacity building, and the tireless pursuit of a “scientific temperament” for the world." 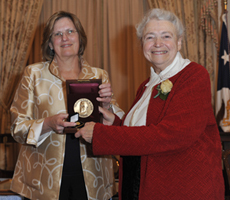 "For her extraordinary contributions to the field of condensed matter and materials physics, especially in nanoscience and carbon science relevant to energy-related applications; for her extensive public service to the scientific community through national leadership and promotion of international collaboration in science; and for her historic role in enlarging opportunities for women in science in the United States and the world." 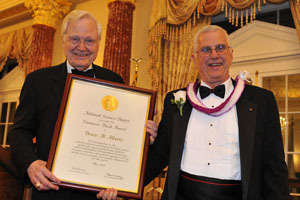 "For his distinguished public service leadership in science, engineering and technology; for his longstanding commitment to the ethical conduct of business and the engineering profession; and for his extraordinary contributions to the welfare of the nation through his advocacy of science, technology and engineering education as national priorities." "For exceptional contributions across the frontiers of science and technology, national science and innovation advocacy, and institutional transformation in education, research, regulation, and governance." 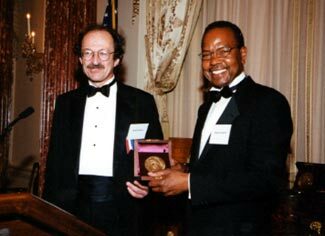 "For his pioneering research in robotics and intelligent systems, and significant contributions in the formation of national information and telecommunications policy." "For his notable scientific discoveries and research in the fields of quantum electronics and astrophysics, and distinguished public service influencing Federal policies on science and technology issues." "For his visionary leadership to enhance U.S. innovation, competitiveness, and excellence at the interface of science and technology with the Nation's industrial enterprise. In the counsels of government, industry, and academe, he unselfishly gave the Nation the benefit of his knowledge, experience and creative wisdom while leading his company in its great contribution to the computing and telecommunications transformation of society." 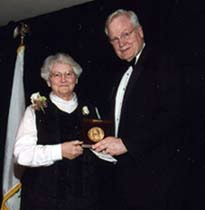 "For her achievements as an educator and industrial research manager. An extraordinary statesperson, a distinguished public servant, and a remarkable scientist, she has contributed broadly to the understanding and promotion of the value of science and technology." "For his notable contributions to electrical engineering and his long-term commitment to the public good as a statesman for science and engineering policy." "For his distinguished public service in the development of U.S. science and technology policy; a scientist, teacher, scholar, business leader and author who has influenced policies of recent Administrations, he has been an inspiration to students and colleagues and a valuable asset to the Nation." "For his research in mechanisms and origin of cancer, his introduction of intramural and extramural research programs, new leadership and expansion of the National Institutes of Health, and his continuing leadership in biomedical science." 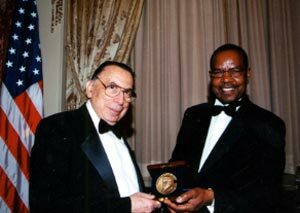 Herbert York: "For valuable contributions through his public service activities in science and technology, shaping the path toward limiting weapons of mass destruction and calling for peaceful methods of conflict resolution; his lifelong dedication to inspiring students in science and public service careers; and founding the Institute on Global Conflict and Cooperation, one of the Nation's largest sources of dissertation and fellowship support on international studies in the United States. He has distinguished himself as a scholar, scientist, diplomat, and public servant." Norman Borlaug: "For six decades of pioneering efforts to expand the world food supply through unprecedented increases in wheat production. His life's work of helping to feed the hungry in nations remote from the media spotlight produced a decade of improved rice yields concomitant with a reduction in pesticide use in India. 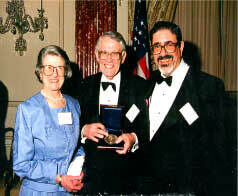 For his participation in the development of high-yield, low-pesticide dwarf wheat that led to the prevention of famine in many countries crediting him with saving more lives than any other person who has ever lived; his training of young farmers and scientists in research and production methods throughout the developing world, and his continual striving to incorporate modern agricultural technology into these developing countries." 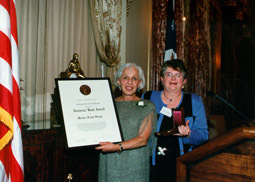 "For her pioneering scientific achievements in molecular biology; for her role in influencing and refinining the nation's science policy, often in realms having social, moral, or ethical implications; for her activism and creativity in inaugurating programs in mathematics and science education for inner city Washington, D.C. school children and their teachers; and for her willingness to speak out strongly and clearly on science matters facing society." "For his uniquely humane and constructive combination of scientific knowledge, extraordinary technical vision, superb managerial skill, sense of civic duty, international leadership, and unsurpassed and sustained energy applied to understanding and protecting the oceans and atmosphere. 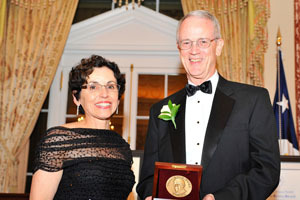 As the first administrator of the National Oceanic and Atmospheric Administration, as the president of the U.S. national Academy of Engineering, and most recently as a senior fellow at the University Corporation for Atmospheric Research, he has provided sustained, unparalleled leadership in the scientific and technological enterprise of the nation. Throughout his distinguished career, he has fostered the search for improvement in the understanding of the environment for the betterment of humankind." "For charting with vision, dedication, and valor new frontiers in science, technology, and public service. As a bench scientist and teacher, his contributions to seminal scientific research in radar during World War II, and to international scientific cooperation in radar and guided missiles, helped America and its allies achieve technical wartime superiority. 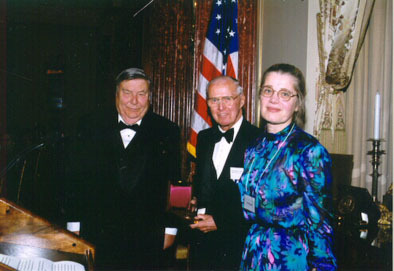 In the post-war era he continued to exercise unparalleled leadership in nurturing the Nation's scientific and technical strengths as Chief Scientist of the Air Force, University President, Science Advisor to two Presidents, Director of the National Science Foundation and first Director of the Office of Science and Technology Policy, and a member of the National Science Board. Throughout his career, he has pioneered the use of science and technology for the benefit of society and the betterment of the human condition. In the most divisive and controversial times, he has been our voice of reason, wisdom, and insight--our sage of science." 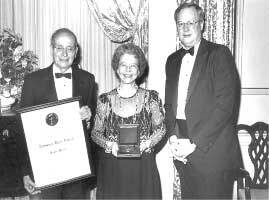 "For his outstanding contributions to science and technology through public service to the national as a versatile bench scientist, accomplished research administrator, and one of the leading public commentators on science and technology in the post-war era. Throughout his career, in all his diverse endeavors, he has demonstrated the rare gift to discern the significant from the trivial and shared his lifelong enthusiasm for science and technology. For generations of readers, his editorials in Science document the progress of discovery, the evolution of our society, and the changing relationship between the two. His willingness to take controversial positions and stand up to the criticism that they generate has raised public understanding of the scientific and technological issues and enriched public policy. A tireless science enthusiast, his legacy is that of an inquiring mind, a probing intellect, and a great editor." "For pioneering explorations of new frontiers in science, technology, and public service. His creativity -- and the profound impact his work has had throughout science -- is exemplified by his insightful development of precision atomic and molecular beam spectroscopy leading to remarkable advances in the physics of molecular beams, particle physics, and precise measurements. In public service to the Nation few can equal his leadership in science and technology, which, during World War II and after, has promoted national security and international peace. An extraordinary teacher, researcher, and scientific leader, his imagination, infectious enthusiasm and many contributions have immeasurably enriched the lives of his students, his colleagues, and the Nation as a whole." 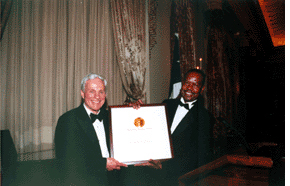 "For pioneering with vision, boldness, and drive the settlement of new frontiers in science; for advancing mankind's welfare through his efforts on behalf of natural hazard mitigation, arms control, and human rights; and for providing inspired national and international leadership in science and technology policy making and education. As a university geophysicist, he made seminal contributions in seismology, increasing our knowledge of nature and then applying his understanding to the challenges of earthquake prediction and arms control. 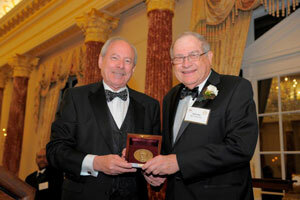 For more than three decades, he has served as an advisor to U.S. Presidents and the federal government. An articulate national and international statesman for science and technology, he has improved the processes of governance and decision-making for the support of research, development, and education. His work has helped protect the planet from the destructive powers of both nature and man. 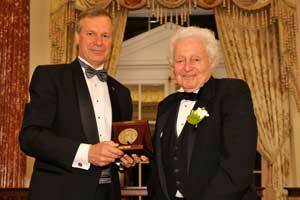 A modest man, his accomplishments speak for themselves and are a lasting tribute to his selfless public service." "For his vision, boldness, and dedication in exploring new frontiers of science and engineering, technology, and education; advancing the welfare of the nation and mankind through public service, leadership, and creativity in science and technology. As president of two universities, he advanced both private and public university research and education. He has been generous with his time and talent, taking a broad leadership role in the growth of the national science and technology enterprise over the last five decades. 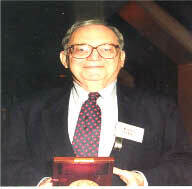 As a scientist, he has contributed to the understanding of corrosion inhibition, metals oxidation and reduction, electrochemistry and passivity; he has participated actively in the organizations of his disciplinary community and in the dissemination of new knowledge; finally, as a scientist and academic leader, he has contributed at both national and state levels to the structures that bind the community of science and technology across academic, non-profit, government and industrial sectors. A compassionate, effective leader, he has been a strong force in the growth and vitality of American science and technology since World War II." "For pioneering with vision, boldness and drive, the exploration, mapping, and settlement of new frontiers in research, education and public service. As a humanist-engineer, he helped transform the information and communications sciences by grasping the essential fusion of their technical and social dimensions. As leader of an already great university, he demonstrated that even greater vistas were obtainable through the union of superb research and inspired teaching. As Presidential Science Advisor, he made enduring contributions to both science and government, while redefining and expanding the concept of the advisory function itself. A man of wit, prescience and the courage of his convictions, he is a prophet recognized throughout the world, and in his own country, for his dedication to the ideals of research in the service of humanity on a world-wide basis." " For pioneering with vision, boldness and drive, the discovery and exploration of new frontiers in space science. 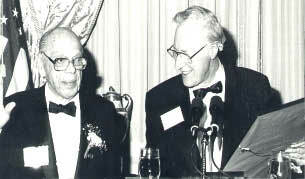 As a charter member of the Johns Hopkins Applied Physics Laboratory, he helped translate a bold but uncertain concept into a reliable staple of his country's defense capability; as chairman of the post-war Upper Atmosphere Rocket Research Panel, he was instrumental in the transformation of space science from an arcane field into an activity of high national significance and visibility; as an eminent advocate of satellite missions to the outer planets, he demonstrated the power inherent in the union of human imagination and scientific rigor. A self-effacing man, his career as scientist and mentor reflects the virtues of hard work, frugality, and devotion to education that were instilled into him by his pioneer family during his formative years." " For pioneering with vision, boldness, and drive, the exploration and settlement of new frontiers in science, education, and social consciousness. Lifelong advocate of the intrinsic unity of science, his grasp of the new physics established the basis for a new chemistry; bold extrapolator of his own seminal discoveries, his painstaking measurements and profound insights paved the way for deeper understandings in biology and medicine; trusted colleague and gifted teacher, his inspired enthusiasm has had a lasting impact on several generations of chemists; champion of social consciousness, he continues to remind his fellow scientists of the public duties inherent in their stewardship of the public trust. A genial man whose insistence on objectivity in all matters is leavened by his generosity and wit, he well deserves the worldwide accolades he has received as one of the truly seminal thinkers of our century." " For pioneering with vision, boldness and drive, the discovery, exploration and settlement of new frontiers in science, education, and public service. Foremost among modern alchemists, he has established order in the realms beyond uranium; advocate of the uses of science for human benefit, he has pioneered unique arrangements for international cooperation; single-minded proponent of scientific responsibility, he has helped introduce rationality into nuclear policy; passionate partisan of opportunity for all Americans to a sound education from elementary through the graduate level, he continues to insist on the integral relationship between science and society. Equally at home in the laboratory, the academies on three continents that have honored him, and the wilderness whose preservation remains an enduring avocation, he carries quietly the many distinctions that befit a humane scientist-statesman. " " For pioneering with vision, boldness and drive, the discovery, exploration, and settlement of new frontiers in the relationships between scientific discovery and engineering practice, and in the promise of science and technology in public service. Pioneer founder of a successful high technology firm, prophetic catalyzer of mutually beneficial relations between university and industry, prescient exemplar of the essential basis for the nation's competitiveness, selfless advisor to government, industry, and civic organizations, his life bears witness to the inseparable links among science, technology, and the public good. A dedicated, hard driving man devoted to excellence in all his pursuits, he well deserves his distinction as one of the world's senior engineer-statesmen. " " For pioneering with vision, boldness, and drive, the discovery, exploration and settlement of new frontiers in science, public service and international understanding. Interpreter of the new physics to the new world, translator of quantum abstractions into visible spatial dimensions, trusted advisor to presidents and world leaders, founder of institutions that have contributed to the security of his country, nurtured Nobel laureates and stimulated international scientific cooperation, his life attests to the profound humanism inherent in his conviction that "the proper study of mankind is science." A dedicated man whose stern demand for excellence has always been leavened by an original wit and deep respect for history, he bears with grace his well deserved distinction as the world's senior scientist-statesman." " For pioneering with vision and boldness, the exploration, charting, and settlement of new frontiers in science, education, and public service. A pioneer explorer of nuclear and subnuclear complexities, a discoverer of the sources of solar and stellar energies, a dedicated teacher, and contributor to his country's defense capability, his deep understanding of the beauty and elegance of the physical universe has inspired student and colleague alike, while his appreciation of the powers and limitations inherent in that understanding has made him a valued counselor to generations of statesmen in war and peace alike. A retiring man of deeply held convictions, the many honors bestowed upon him by governments and private institutions on three continents attest to his status as a citizen of the world." "For pioneering, with vision, boldness, and drive, the exploration, charting, and settlement of new frontiers in science, technology, and public service. As an inspired oceanographer, he has charted new intellectual and physical frontiers, opening up pathways to understanding the origins of the earth and the ocean basins, and establishing his field as an exemplar for international scientific cooperation. As a visionary ecologist and compassionate demographer, he has shown that scientific knowledge can help breach long-standing barriers to human progress and dignity. As an advisor to international organizations, foreign governments, and two branches of his own government, he has functioned as an educator, tenaciously prodding policymakers to build the scientific knowledge required to attack fundamental and enduring problems. A compassionate, courageous, thoughtful man who leavens his deep convictions with gentle humor, he is admired in many lands as a living demonstration that science and humanism can be natural companions." "For pioneering, with vision, boldness, and drive, the exploration, charting, and settlement of new frontiers in science, technology, education and public service. For pathfinding leadership on the frontiers of science, for achieving excellence as an educator and public servant, and for pursuing peace with freedom and compassion among nations. As pioneer investigator of the quantum effects in solids, he became the intellectual leader of a new subfield of physics. As teacher and administrator, he inspired students to distinguished careers and helped great universities hold their course in difficult times. As technological innovator and as President of the National Academy of Sciences, he forged links among industry, academia, and government. As scientific statesman, he provided wise counsel to governments at home and abroad and to international bodies. A man of uncommon depth and insight, he has brought to each undertaking modesty, gentle humor, boundless energy, and unwavering integrity." "For pioneering, with vision, boldness, and drive, the exploration, charting, and settlement of new frontiers in science, technology, education, and public service. As youthful head of the World War II Radiation Laboratory, he conquered new reaches of the electromagnetic spectrum and thus helped deny, to his country's enemies, the conquest of Europe and the Pacific. As a charter member of the National Science Board, he assisted he pilot of an infant agency to negotiate passage between the Scylla of academic suspicion and the Charybdis of bureaucratic misconception. As leader of a great educational institution, as advisor to Federal agencies and to a President, he opened new frontiers in the use of science for the public good. Always the most genial and amicable of men, he nevertheless continues to stand as stern centurion on the ramparts, zealously defending the best traditions of quality science and freedom for inquiry." "For his outstanding contributions toward the welfare of the Nation and mankind through public service activities in science and technology. As leader of one of the world's most farsighted industrial laboratories, he has generously donated his exceptional talents to countless public institutions, great and small. Always shunning the limelight, he has become the oracle of American science, sharing his idealism and practical wisdom with Presidents and scientists in public service." 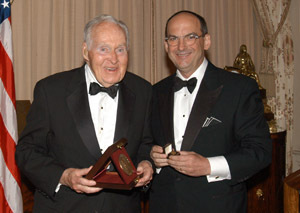 "For his outstanding contributions to science and technology through public service to the Nation as one of the leading spokesmen for educational innovation and curriculum reform, for strengthening and broadening engineering education, for support of basic research, and for his distinguished record of service from World War II to the present time."